Fred Smith has just finished a stint working with the ADF attempting to bring prosperity and peaceÂ to Afghanistan and is now back saving the world through the medium of folk singing. For those who don’t know, Fred is a bit like Paul Kelly if Paul Kelly were Fred Smith and moonlighted for the Department of Foreign Affairs, occasionally in war zones. He’s quite hard to describe, so best pop along and see for yourself. I’m only passing this on as I’ve already got tickets to the show. Do yourself a favour, etc. I have cut and pasted the official blurb below…. 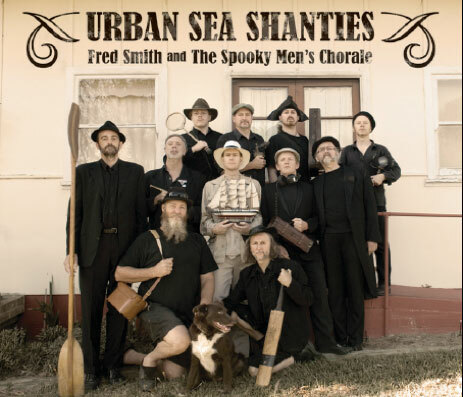 Fred Smith teams up with the Spooky Men’s Chorale to present songs from their collaborative album Urban Sea Shanties â€“ a project that began as a conversation in the session bar at the National Folk Festival and turned into an award-winning album. Urban Sea Shanties is a collection of thinking man’s drinking songs.Â The album was awarded the National Film and Sound Archives National Folk Recording Award. The Spooky Men’s Chorale are a legend of the Australian Festival circuit. Their collaboration with Fred Smith began as a momentary lapse of reason in a festival bar that turned into a gig and then into an album. I MC-ed Fred at Cygnet – he was SO good. I especially loved his love song to Mary Ann. What a nice bloke he is.